"By the middle of the 21st century, a team of fully autonomous humanoid robot soccer players shall win a soccer game, complying with the official rules of FIFA, against the winner of the most recent World Cup." 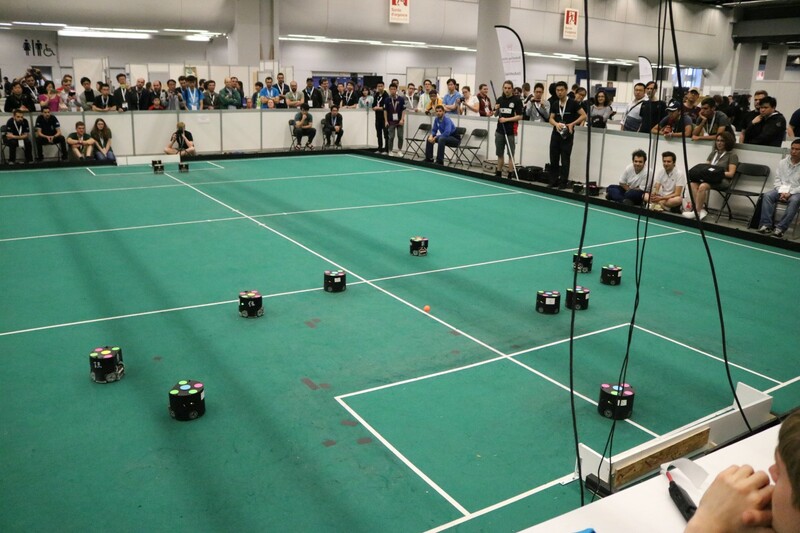 The Small Size League is one of the first leagues of the RoboCup and was established in 1997. As of 2018, there are 8 vs. 8 robots playing against each other in a soccer game, similiar to real soccer. The current field dimensions are 12m x 9m. The field size was roughly doubled compared to the previous years. The given numbers apply to division A which is the home for experienced teams. Division B, designed for new teams, uses half the field size and 6 vs. 6 robots. The size of the robots is limited by the rules (height of 15cm, diameter of 18cm). Each team builds its own robots. There is a central processing system that uses cameras on top of the field to track all robots and the ball and sends coordinates to the teams' computers. 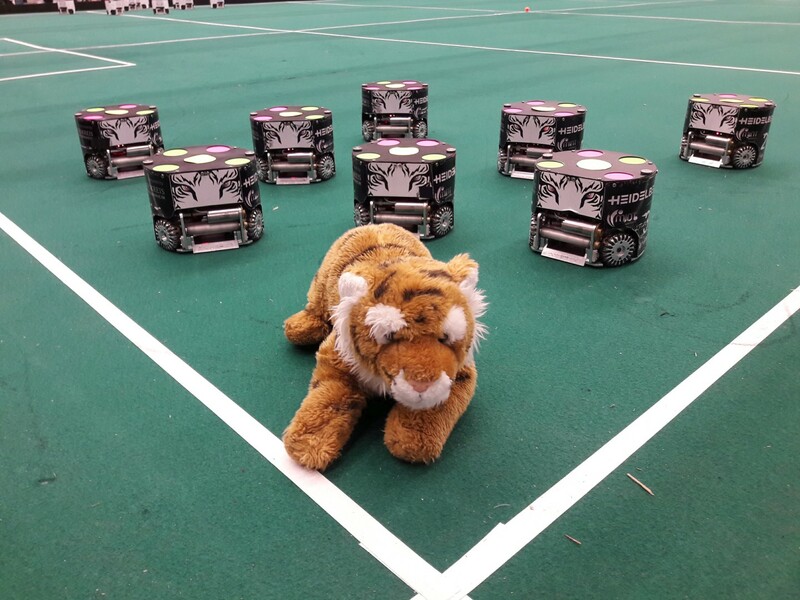 The robots are tracked using a custom pattern on top which encodes the team color and a unique id. Each team must develop an artificial intelligence (AI) that runs on a regular computer next to the field. The communication to the robots must be developed by each team independently. No human interaction is allowed during a game, except for a human referee. In upcoming years, the human referee will also be replaced by an autonomous system. The robots have omnidirectonal wheels to move in any direction, regardless of the current orientation. They usually have devices for kicking the ball either plain forward on the field or to chip it for high balls. The maximum allowed ball speed of 6.5m/s can already be reached by many teams. There is usually also a sensor for detecting if the ball is touching the kicker. Additionally, many teams use a dribble device that can keep the ball in front of the robot or pull it backwards by giving the ball a backspin.